It’s true. They are. They are those trendy small ones. They have a QR code. 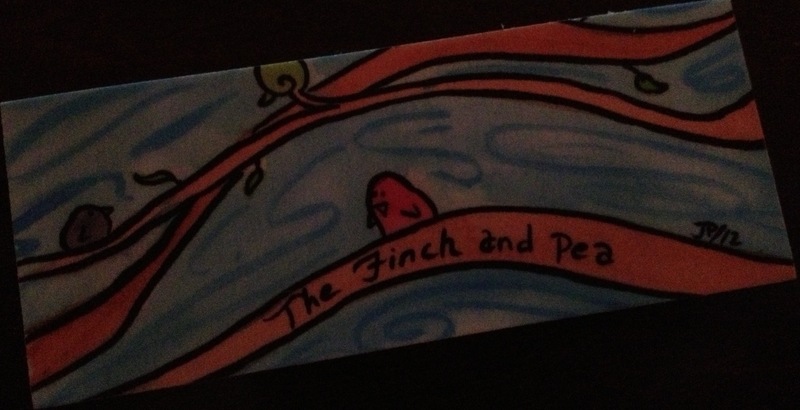 And, most importantly, they have original, The Finch & Pea inspired artwork by Jill Powell. At the 2013 Santa Fe Science Writing Workshop, I gave one of those cards to Karen McLeod of COMPASS. That lead to a thoroughly enjoyable conversation with COMPASS’s MBA intern, Ben Hamm. But over the course of more than 40 interviews with thinkers in nonprofits, government, journalism, and the private sector, I discovered a cultural divide among scientists themselves – between academics and their counterparts in industry. . .While there’s plenty of cross-pollination between university and commercial scientists on topics like chemistry, geology, and medicine, it seems that communication grows thinner in more interdisciplinary and holistic fields like ecology and climate. If this is true, it points to many missed opportunities for both groups to learn from one another. This entry was posted in Follies of the Human Condition and tagged Business, COMPASS, Industry, Linkonomicon, Science Communication. Bookmark the permalink.